Mike wins with his 7:21 a.m. Tuesday guess "We're at Burbank Airport. As for what's happening -- a Memorial Day airshow?" 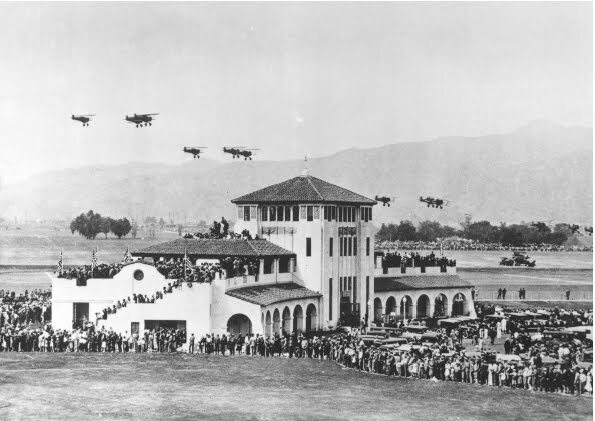 In the photo above, planes perform in an air show during grand-opening ceremonies at Burbank Airport on Memorial Day weekend in 1930. What's in a name? Dubbed Bob Hope Airport in 2003, it originally opened as United Airport in 1930, having been built by the forerunner of United Airlines. The name became Union Air Terminal in 1934 and was changed to Lockheed Air Terminal in 1940 when Lockheed Aircraft Corporation bought the airport. In 1967 Lockheed dubbed it Hollywood-Burbank Airport and it became Burbank-Glendale-Pasadena Airport in 1978. 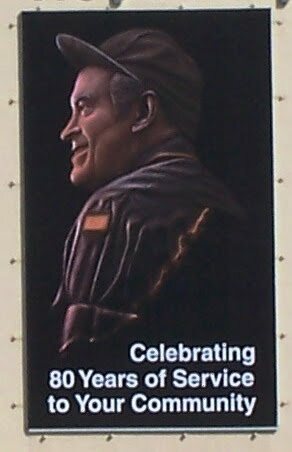 An 80th anniversary banner was unveiled at the Bob Hope Airport last Friday and will remain in place throughout the summer. The nine-member Burbank-Glendale-Pasadena Airport Authority, which owns and operates the airport through a joint powers agreement, has three members representing each city. Pasadena's members, appointed by the Pasadena City Council, are Joyce Streator (president), Chris Holden and Francis D. Logan. I replay airport authority meetings on KPAS Tuesdays and Thursdays at 10 p.m. There was a special 80th anniversary celebration at Bob Hope Airport yesterday. Many thanks to Victor Gill, my counterpart at Bob Hope Airport. I am no longer scandalized, just more informed. Is it still the same (much altered) building? Petrea, you're right -- I think this is the first time I've shown a photo from outside Pasadena's borders! I'll check with Victor Gill about the building.